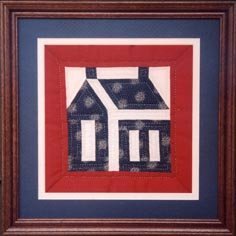 The schoolhouse has always been one of my favorite patterns and fun to piece! The block size is five inches but adding the borders it will finish at ten inches. This kit is available in two colors, navy and red or sage green and red. Please specify when ordering. This kit is a Beginner level.